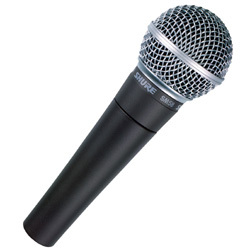 Known for its classic sound, the Shure SM58 is one of the most popular professional mics in use today. The cardioid pattern mic is tuned to accentuate the warmth and clarity of lead and back-up vocals. The "58" is especially durable too, well known amongst professionals for its ability to maintain its quality of sound and withstand abuse that would trash most other mics. Frequency response is a smooth, vocal-tailored 50Hz-15kHz. Uses a standard XLR cable (not included).